Rod R. Villemaire, a Maine native, shares his passion of birds with everyone he meets. His love and fascination of birds started in the mid 70's and has continued as a lifelong study, including caring for and rescuing of all types of birds during his free time. Rod has worked as a fire fighter, paramedic and nurse from 1985 to 1999 until injured in a fire fighting rescue attempt. Since his injury, he has devoted his life full time to sharing his passion of birds. On January 1, 2002 Rod opened his 1 acre Small Bird Rescue & Retirement Center in Mesa, AZ. In 2004 he opened an additional 5 acres in Queen Creek, AZ. By 2005 he completely filled up the 6 acres with birds, and started moving the birds onto the land and into the homes of his volunteers. Realizing that there was too much demand for any one rescue center to handle he transformed his organization in 2005 into the nationwide All Bird Rescue Foster Network. The rescued birds living with the volunteers were staying tame and were adopted out at a much faster rate then those kept in "warehouse conditions" at the center. These birds also got great one-on-one care, so he realized this is the way of the future. Due to overpopulation and a lack of volunteers, most rescue organizations across the USA close down each year. His Foster Network was a way to stop this problem once and for all. While working with 1000's of rescued birds over the years, Rod has applied some of his nursing knowledge of natural remedies and techniques to terminally ill birds and obtained miraculous results. His unique methods of taming, training, and simulation of the birds natural living conditions in the wild has completely turned all of his unadoptable birds into the great adoptable pets. These birds will provide years of joy and companionship to their owners. Rod Villemaire's book, "A Bird's Eye View" will unlock his secrets on caring for your birds. You will also learn how he has kept his longtime companion Tweety, a 21-year old budgerigar, healthy and happy with his diet and bird care routines. Rod will show you how to combat unwanted bird behaviors to provide a happier and safer environment for human and bird alike. 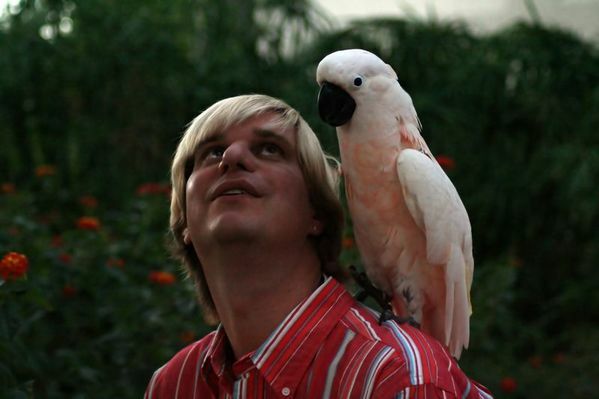 In January 2006 Rod sold his home and land in order to teach people about birds full time all over the USA. He shares his 36 foot motor home with his 10 birds, holds nationwide bird training seminars at bird clubs and shows while promoting his foster network. While traveling, he also enjoys teaching about birds to children in schools, day-care centers and summer camps. This newest book is part of his mission to educate as many people as possible about the joy of and proper care of birds. Page updated 3/6/13 © Copyright 2008 Rod Villemaire, CAS, Ornithologist, Host, Published Author, Webmaster and founder of the All Bird Rescue Foster Network.